The project is located about 300 kilometres (200 miles) inland in remote central Queensland. Yet the new report finds these 36 conditions will not stop the mine from pushing the endangered Black-throated Finch closer to extinction by destroying critical finch habitat in the Galilee Basin. They will not safeguard the ecologically and culturally significant Doongmabulla Springs, and will do nothing to protect the Great Barrier Reef from the damage the mine’s coal will do once the coal is burned, the report demonstrates. “Far from being the strictest in Australian history, these conditions have so many gaps you could drive a mining truck through them, which is exactly what Adani intends to do,” said Australian Conservation Foundation CEO Kelly O’Shanassy. Instead of safeguarding habitat critical to the survival of the species, the conditions allow Adani to destroy this area, provided it offsets the destruction by providing alternative habitat for the species at another location. Adani is not required to protect this alternative habitat before starting construction of the mine, nor is it required to provide evidence that the offset will actually protect the finch, the report points out. If the impact on the finch from the mine turns out to be greater than expected, Adani is not required to take further action or make good the unexpected harm. 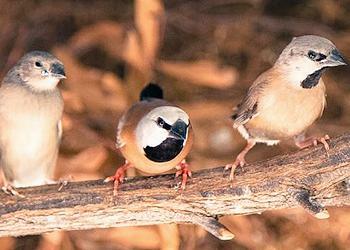 “Adani is permitted to bulldoze an area that is home to the largest surviving population of the endangered Black-throated Finch on the condition that the company provides alternative habitat for the species at another location, yet Adani is not required to protect this alternative habitat before destroying the finch’s current habitat,” said O’Shanassy. The Adani Carmichael coal mine also threatens the Doongmabulla Springs complex. These springs are culturally significant to the local Aboriginal people and are a precious source of water for a unique ecological system of species in this dry landscape. The conservationists say that the minister has granted approval for the mine without being certain about how it could affect the Doongmabulla Springs. The minister has not even been able to ascertain what level of interference will cause the springs to dry up. The approval conditions require research programs to be conducted to establish the full extent of the impact, but these are not required before mining excavation is allowed to begin. The damage could be done before the results of any studies are known. Once a spring goes dry, it cannot be restored. “Australia’s laws are clearly not up to the job of protecting the unique creatures and places Australians love,” said O’Shanassy. “The new Minister for Environment & Energy, Josh Frydenberg, should not rely on the previous minister’s approval of the Carmichael mine and the ineffective conditions attached to it, but should re-assess it with all the evidence he now has,” she said. Frydenberg was sworn in as Minister for the Environment and Energy on July 19. The Carmichael Coal Mine was proposed in 2010 by Adani Mining Pty Ltd, a subsidiary of the Adani Group from India operating as Adani Australia for its Australian projects. Adani first proposed to extract up to 60 million tonnes of coal a year for 150 years from an estimated coal resource of 8.3 billion tonnes. Later, the company reduced the project lifetime to 60 years and estimated total production of 2.3 billion tonnes of thermal coal. Even with the reduced timeframe and scale, the proposed mine is one of the largest coal mines in the world and the mining and burning of coal from it will generate an estimated 4.7 billion tonnes of greenhouse gas emissions. These emissions are over 0.5 percent of the remaining carbon budget to have a likely chance of limiting global temperature rises to 2 degrees Celsius above pre-industrial levels as required under the Paris Climate Agreement reached in December 2015. Coal from the mine is proposed to be transported by a new 189 kilometer rail line to the Port of Abbot Point for export to India to be burned for electricity production. Due to its enormous scale, its impacts on the local and regional environment, and the consequences for climate change if it proceeds, the mine has been strongly opposed by conservationists and has been the subject of multiple court cases. The applications for the mining lease and the environmental authority for the mine under Queensland law were the subject of an objections hearing in the Land Court of Queensland. A number of objections were received. A conservation group, Land Services of Coast and Country Inc., objected to the grant of the mining lease and the environmental authority due to its potential impact: on the Black-throated Finch, on groundwater and groundwater-dependent ecosystems, particularly the Doongmabulla Springs Complex and Mellaluka Springs Complex; and the contribution that the burning of the coal from the mine will make to climate change, thereby contributing to environmental harm to the Great Barrier Reef World Heritage Area due to climate change. The Land Court delivered its decision on December 15, 2015. It recommended that the mining lease and environmental authority be granted subject to monitoring of impacts on Black-throated Finch. Following the Land Court’s recommendation, the environmental authority for the mine was granted under the EPA on February 2, 2016. The mining lease for the mine was granted on April 3, 2016. The Carmichael mine is central to Adani’s plans to deliver 10,000 direct and indirect jobs across its mine, rail and port projects, and $22 billion in taxes and royalties to Queensland over the half-life of the projects. Adani says that the high calorific value coal to be mined at Carmichael has an ideal ash and sulfur content for use in the latest generation supercritical generators in India, which the company says are more efficient than those typically operating in Australia, helping to deliver more energy with less coal and fewer emissions.